My seat runners are spaced off the carpet using a pile of penny washers. This allows for the front to be raised slightly compared to the rear to get more of the bucket feels and also less likely to slide forward under heavy breaking. You can fill a bag of penny washers at Wilko's for pennies. Jon wrote: I may be wrong, but I believe the driver's seat has to be adjustable backwards and forwards to pass the MoT. Worth checking. There is no rule that the seat has to be adjustable. The rule is that where seat adjusters are fitted then they must move freely and lock securely. This works in the same way that cars that pre-date mandatory seat belts (1966) don't have to have seat belts fitted, but when fitted the belts must meet the test requirements (though pre-66 cars no longer require an MOT). I'm with Dzus in preferring to mount the front of the seat runner higher than the rear. This usually helps the front of the seat to support the thighs better and also means that the base of the seat rises for shorter drivers as they move the seat forward. The downside is that if you put in too much rake the seat will always run backwards when the lever is pulled. So the trick is to make sure that the rake angle isn't enough to overcome friction. 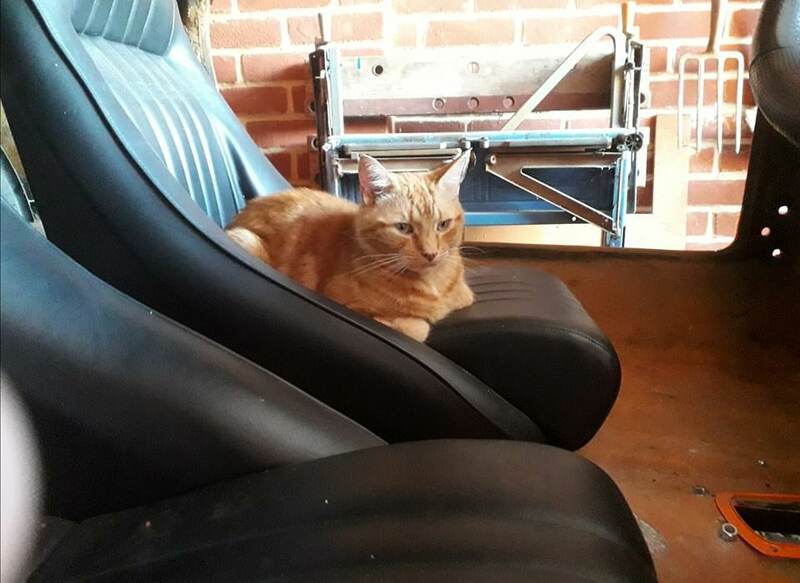 I have decided that I will come back to the seat issue. It has bugged me for a while, so much so that I shut the Midas in the garage, enjoyed the sunshine a bit and sulked about the Midas. A lot. Whilst trying to figure out something else to do to get some motivation back, I turned my attention to the front lights. Well, the headlight covers, to be more precise. Now mine were in a real state - they were not attached to the car properly when I got it - just jammed in place and there were holes from where some form of fixing had been used and had long since disappeared. Time to repair and rejuvenate! Headlight covers as found - lots of holes and imperfections. As I discovered that I had run out of satin black paint (just as I was spraying the headlight covers, causing a splutter or two and the need for a re-paint), I had a look at the sidelights/indicator units. These were Triumph Dolomite units and the wiring was, for want of a better word, utterly banjo'd. By this I mean that the wiring was black and or corroded, so I needed something to replace it. New wires added to the front sidelight/indicator units. Damaged rubber cover was replaced with a better one. What the unit looks like on the car (well, half-attached anyhow...). Looks like you're on to a winner. If you are loosing 6 lb in one afternoon that is "weigh" better than slimming world. Either that or at the same time as you are working on your Midas you also have a sauna saving you time. It is still very hot here and my garage is still like a blast furnace. So recently I've done precious little in the garage and done other things less likely to give me heatstroke. I had a chat with my father-in-law, who runs a company that makes car cleaning products, about cleaning the K&N filter that I had fitted to Zippy. It really was quite dirty and I had read that one of the best things to clean them with was TFR (Traffic Film Remover). This is mainly because it's significantly less harsh than straight petrol. Steve said that TFR was an option, but also that his general purpose cleaner in neat form would be just as good as apparently the basic recipe is the same. So he got me a decent sized bottle of it and I was able to get my hands dirty. I poured the cleaner into an old washing up bowl, dunked the filthy filter in and gave it a good going over with a sponge. All I need to say is "Whoa! That's a LOT of dirt!" Once I'd done this 3 times, I gave the filter a good rinse with clean water and put it outside to dry. How much dirt came out? Well, the picture of the fluid speaks for itself... I shall re-oil it once it's dry. I have cleaned a K&N filter in the past using their own cleaning solution. The instructions are to use a fairly shallow tray and to fill it with the cleaning fluid. The filter is then immersed with the outer surface immersed but the inner surface just out of the fluid, this is so that you do not transfer the dirty fluid to the inside surface where when dry it could then be sucked into the engine. You then have to do the other parts of the filter in turn. Give it a slight agitation to loosen the dirt. Once wet you could then blow from the inside to outside with a low pressure airline and then let it dry before re-oiling with the K&N solution that is sprayed onto the outer folds of the filter. The cotton filter then turns pink again. If you think it is hot in Suffolk, I am currently in USA on a road trip, Denver to Arizona, now in Utah before returning to Colorado. Have seen temperatures up to 39 and have also driven through some very heavy rain storms (their monsoon season) where even driving at 30 mph with the wipers on fast was almost undrivable. Just glad to have air con. Re: Mk 1 Project Zippy. I Now Fit! When I was in California a couple of years ago dusz we hit about 38-39 degrees in Yosemite. It was whilst wondering what all the buttons did in our enormous SUV we found out it had air conditioned SEATS. SOOOOO Good! Hope you've enjoyed your trip. Just another minor update - but it's a good one: after a minor modification, I now fit. Thanks to the wise words of the Midas experts on here, I removed the 1/2" spacer I'd fitted to the rear runner mounting, thus tipping the seat marginally backwards. Considering it was such a small amount I have managed to make enough room to snugly fit myself in. There's not a massive amount of room but I don't care. This makes me happy. I shall measure up and do some drilling in due course to properly mount the seats. I took the time to oil the now cleaned K&N filter using their own oil in an aerosol. It has now regained its reddish hue and smells like a it's come straight out of the box. Lovely. Finally, whilst fitting the filter back on to the carb I took another look at the heater pipes. They were only roughly in place so were open to adjustment. I hated the way the pipe from the heater outlet on the head just sat badly over the carb area, so using some 90 degree connectors and the inlet manifold it's a lot neater. It's still a work in progress and I may move the fuel pressure regulator slightly but the basic principle looks good. Slightly re-positioned seat - now allows my head to not hit the roof! Newly oiled K&N - looking like it should again. And re-positioned piping complete with colour coded elbow connectors. Some tweaking still required. Once again a very small update, but little bits done now means more time later (or something like that anyway). As I had decided to reposition the heater pipe I found I had an issue with the heater valve clashing with the fuel pressure regulator. I started thinking about making new brackets but then realised I didn't have flat steel in anything approaching the right size. Short of cutting the fridge in the garage up (a no-go as I rather like my Pepsi Max, ice-cream and beer), I decided on the next best thing and moved the bracket. Using the left bolt in the right hand hole, moving the bracket and then drilling a further hole, I was able to move the whole bracket over by about 2/3", which was more than enough to allow enough clearance for the heater valve. I know this now means I have a grommet for an unused hole, but you can't see it unless you take half the front end apart. By this time Sherman had joined me which made tightening up the bolts slightly more problematic but eventually it was all back together. Moving bracket made for more room although it's difficult to tell from this pic. Must use better angles next time... Original hole can be seen on the left. Sherman came to help; and found a new comfy. Fuel pressure regulator moved and bolted up, grommet now in place. Re: Mk 1 Project Zippy. Getting Hosed. Well I managed to fit a little bit in this weekend in between my duties for Mrs B and helping to sell my mate's trike project (success achieved). I have been pretty slack on the car this year, but it has been kind of interrupted with a house move where the car itself was missing for the best part of a month, not to mention an unexpected bout of pneumonia and having to recover from that (which takes WAY longer than expected!). Plus there's the added bit that I've never re-built a car before and a lot of this was missing or badly done so I've had to concoct various changes along the way. I've been learning a LOT along the way but I am very low on knowledge in other areas (wiring for example). I may well hit the project with a bit more oomph in the next few months. So just a couple of minor things again for now. I've sorted the bottom hose arrangement. I bought myself an aluminium straight pipe and used that to connect the Metro bottom hose to the radiator with a nice bit of 90 degree hose. Naturally the space in there was somewhat tight and given the odd shape I had to get myself into to tighten everything up I am not surprised that I now ache a bit. Still, it's nicely sitting there and doesn't appear to require any additional support. That can be tweaked in the future if needed. The other thing I've done is a temporary measure - I've added some fuel pipe from the pressure regulator to the carb. This will be replaced with some hard fuel line and bent to shape once I can get some. I shall consult my mate's loft as I am certain he's got some stashed away somewhere. Temporary fuel hose - hard fuel line to follow.